How to connect X-Plane 11 to the MSFlights Simlink server for group flights. To connect X-Plane 11 to the MSFlights Simlink server to participate in group flights, all you need is X-Plane and XSquawkBox. Extract XSquawkBox and place the files into the X-Plane\Resources\Plugins folder. Appendix 2. How to connect X-Plane 11 to the VATSIM server for MSFlights group flights on VATSIM. Last edited by Bluejay; May 7th, 2018, 12:24 PM. Thank you BlueJay! :eagerness: Update: XSquawkBox v1.3.3 does work provided you don't use the FSD proxy. If you insist on using the proxy, you have to go back to v1.3.1 of XSquawkBox. Therefore I'm recommending using current release v1.3.3 and not using the proxy, which is a cleaner and simpler solution. The current release can be downloaded as usual from http://xsb.xsquawkbox.net/ though I'll still keep v1.3.1 in Storm's Hangar for pilots who, for whatever reason, want to keep using the proxy. You may want to adjust your opening post! Why are people using the Proxy if it's not needed? I seem to remember adding the correct response to Simlink so the Proxy wasn't needed. The Proxy should only be needed for Vpilot as you can not enter an address directly into Vpilot. If XSQUAWKBOX supports voice(I dont know if it does?) try roo.servebeer.com as the server. Also if you Google Swift pilot client, that also seems to be coming on nicely too. Thanks Storm and ATC_ROO for the input. I wasn't sure if the Proxy might be required to ensure that all aircraft are visible to all participants in all configurations.. hence the inclusion of the configuration with the addition of the MSF Proxy. Both aircraft are visible to each other. I have sent a screenshot to Storm to confirm. MSF Proxy is not needed for X-Plane running XSquawkBox to connect to the MSF simlink server. I have removed the entry in my documentation for now. Swift sounds likes it's going to be a great allpurpose replacement for the several pilot clients currently used for cross platform support on VATSIM. Last edited by Bluejay; July 14th, 2017, 03:50 AM. XSquawkBox (herein called XSB) uses model matching. Aircraft models for model matching are csl packages. How to install models for model matching using X-Plane 11, XSquawkBox and the MSF Simlink server. A CSL folder typically is named in relation to the Aircraft model it contains. Last edited by Bluejay; July 14th, 2017, 08:35 AM. Thank you all for clearing this up for me! 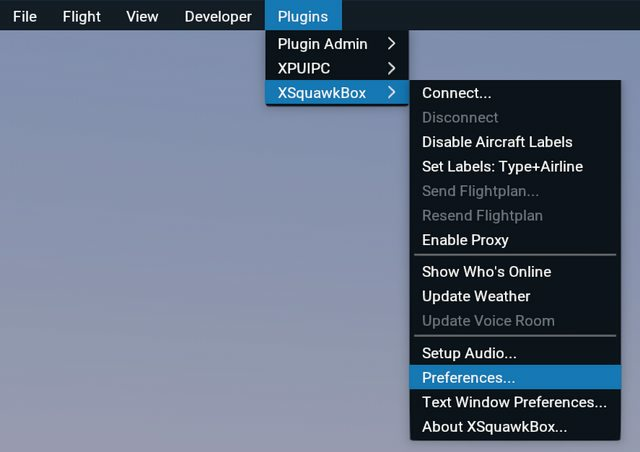 By the way, I only posted up the x-plane / xsquawkbox / msflights simconnect instructions because the link to the original instructions are not available to Rookie Pilots on MSFlights.net. .... original instructions are not available to Rookie Pilots on MSFlights.net. I don't understand specifically what this means? Can you elaborate so we can fix it. Thanks for the work in updating the instructions. SimLink Installation instructions. This is only essential information to get you started in the simplest way. Full detail explanation and any other information about the system, please refer to the excellent Post by ROO here "
Not sure if it's this, but when I click it, it says... "Invalid Thread specified. If you followed a valid link, please notify the administrator"
Karl, the thread Bluejay and Pops0 refer to is visible for site admins (like myself) but sadly not available for everyone else. When you connect to SimLink or VATSIM with XSquawkBox, by default it uses "live" network weather. Of course this is a Good Feature™ if you're flying in VATSIM under ATC as otherwise you would have to tell the controller you were not using VATSIM weather. However when you're flying in SimLink, where we expect a degree of autonomy, it can cause a problem. For example, I've had a problem in SimLink where I would override the weather in X-Plane 11's set-up, say to CAVOK, and a few minutes later it would mysteriously reset to something else. This was especially embarrassing while leading a group flight recently when I'd set a nice clear sky - for taking screenshots on approach - and it suddenly changed to a foggy Cat I on short finals! Fortunately this problem can easily be fixed. I traced it to XSquawkBox and its periodic weather downloads. They can be stopped by adjusting XSquawkBox's preferences and setting "Check Weather every" to zero minutes. (See pictures below, with relevant section ringed in red.) 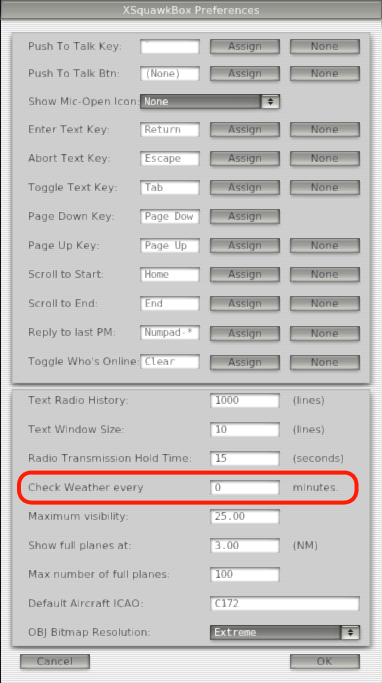 The weather will now stay as you have configured it within X-Plane 11. Setting the preferences this way also removes another annoying problem. Weather updates can cause a stutter or sharp dip in frame rate if you have XSquawkBox running and connected. This is especially so if the server does not have weather for where you are, which causes XSquawkBox to "thrash" (yes that really is a genuine computer science term!) as it tries to find a weather station nearby, sending potentially hundreds of requests to the server. Setting the check weather update period to zero stops this stuttering and your flight is smooth. For more information on this, please read the XSQUAWKBOX USER'S GUIDE in X-Plane 11\Resources\plugins\XSquawkBox\Docs. All times are GMT. This page was generated at 07:09 PM.